Electronics Arts has announced an agreement to acquire PopCap Games, a leading provider of popular games for the mobile devices including: Plants vs. Zombies, Bejeweled, and Zuma. "EA and PopCap are a compelling combination," said EA CEO John Riccitiello. "PopCap's great studio talent and powerful IP add to EA's momentum and accelerate our drive towards a $1 billion digital business. EA's global studio and publishing network will help PopCap rapidly expand their business to more digital devices, more countries, and more channels." "We picked EA because they have recast their culture around making great digital games," said David Roberts, CEO of PopCap. "By working with EA, we'll scale our games and services to deliver more social, mobile, casual fun to an even bigger, global audience." "PopCap has a proven financial trajectory with sustained revenue growth and double-digit operating margins," said EA CFO Eric Brown. "On a non-GAAP basis, this deal is expected to be at least ten-cents accretive in fiscal year 2013." PopCap is one of the largest and most respected digital and social gaming companies with more than 150 million games installed and played worldwide on platforms such as Facebook, RenRen, Google, iPhone, iPad and Android. 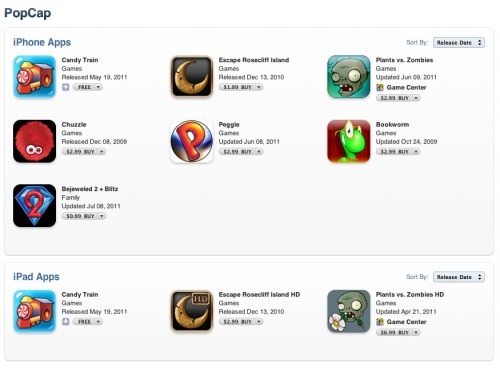 In calendar year 2010, approximately 80% of PopCap's revenue was on high growth digital platforms. EA will pay approximately $650 million in cash and $100 million in shares of EA common stock to be issued to certain stockholders of PopCap. In addition, the PopCap sellers are entitled to additional variable cash consideration, contingent upon the achievement of certain non-GAAP earnings before interest and tax ("EBIT") performance milestones through December 2013, EA's third fiscal quarter end. At the upper end of the earn-out, the performance targets for EBIT are approximately $343 million in total PopCap standalone EBIT generated over the two-year period through December 2013. The exact earn-out calculation is subject to adjustments. EA will also provide up to $50 million in long-term equity retention awards to PopCap employees to be granted over the next four years.